The tunnel quick freezing machine that contains our rich design experience is being assembled in the customer site. It is expected to start-up by the end of this month. 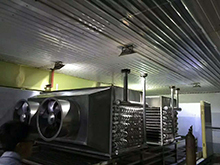 This quick freezer is one of frozen French fries machine with a capacity of 200Kg/h line.